This urban and hip hotel in the heart of Surry Hills is a comfortable haven for your next Sydney trip. 57 Hotel has tasteful design elements of the 70s, playing homage to Studio 54. With room names including 57 Single, Mini Disco Double and Dancing Queen, you’re bound to arrive and check out with a smile. 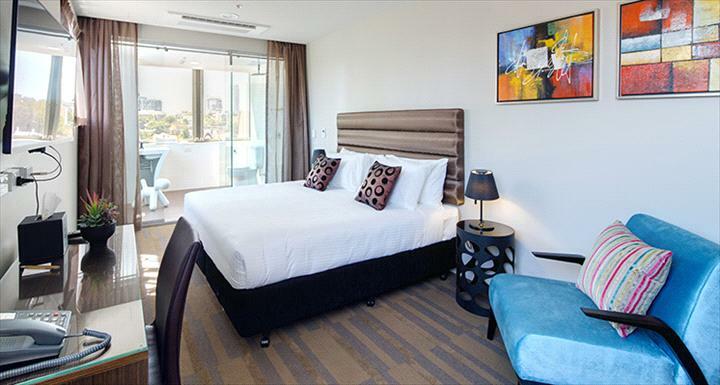 Newly renovated, this Surry Hills boutique hotel offers modern luxuries with a 70s twist. From the liquid gold entrance concept to the groovy tunes found on your in-room iPad, there’s plenty of funky extras you will love about this Surry Hills hotel. Rooms are contemporary and comfortable. If you’re staying in the King, enjoy great views of the city. Families can enjoy hotel baby cots and the interconnecting rooms available and early morning surpirse tiny teddies, plus there’s complimentary coffee and croissants for the parents. 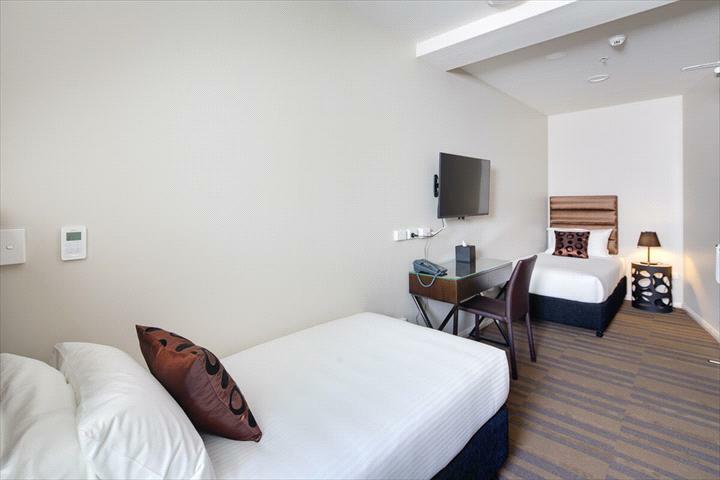 For guests looking to explore the city, you’re a 3 minute walk from Central Station. 57 Hotel enjoys the perks of the Surry Hills bar and dining precinct, meaning there’s always something close by for a late night snack. 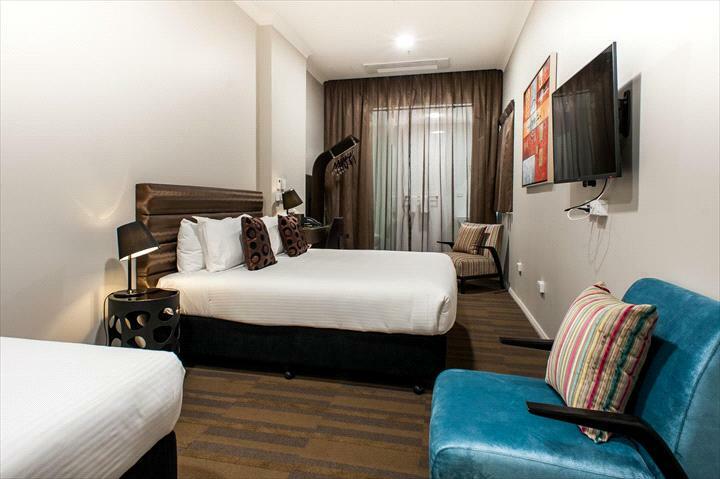 57 Hotel is located in Surry Hills, Sydney just a short walk from Central Station. Cancellations or changes to the booking are permitted up to 24 hours prior to arrival. Changes cancellations or no-shows after this time are subject to cancellation fee of 100% of the total amount of the booking. Otherwise known as the tiny room, our single bedded room with all of the creature comforts at an entry level price. Your comfort is assured with air-conditioning throughout, personal safe and complimentary local phone calls. Your ensuite bathroom features a rain shower head, hairdryer, cosmetic mirror and Urban Skincare co bathroom amenities. For your entertainment, HDTV, cable television and in-room i-pads and for the workaholics, a desk area with FREE WiFi access available and mini bar available on request. Slightly larger than the Studio 57 rooms, this studio style cosy pad comes with two single beds, perfect for colleagues or friends needing to share. Your comfort is assured with air-conditioning throughout, personal safe and complimentary local phone calls. Your ensuite bathroom features a rain shower head, hairdryer, cosmetic mirror and Urban Skincare co bathroom amenities. For your entertainment, HDTV, cable television and in-room i-pads and for the workaholics, a desk area with FREE WiFi access available and mini bar available on request. A space for work, rest and play, our Mini Diso Double have a double bed. Your comfort is assured with air-conditioning throughout, personal safe and complimentary local phone calls. Your ensuite bathroom features a rain shower head, hairdryer, cosmetic mirror and Urban Skincare co bathroom amenities. For your entertainment, HDTV, cable television and in-room i-pads and for the workaholics, a desk area with FREE WiFi access available and mini bar available on request. Feel more comfortable with a bit more space, then the Dancing Queen will be perfect. 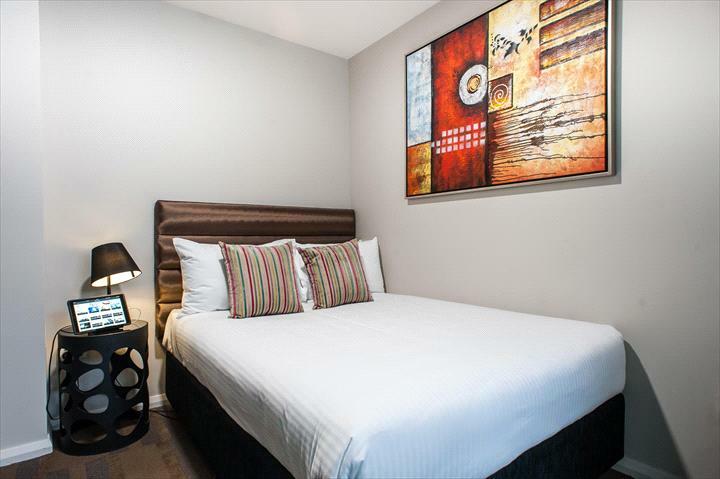 With a large Queen Bed you will truly feel at home during your stay. Your comfort is assured with airconditioning throughout, personal safe and complimentary local phone calls. Your ensuite bathroom features a rain shower head, hairdryer, cosmetic mirror and Urban Skincare co bathroom amenities. For your entertainment, HDTV, cable television and in-room i-pads and for the workaholics, a desk area with FREE WiFi access available and mini bar available on request. Our most spacious room, with the majority of kings having magnificent views of the city skyline. Your comfort is assured with airconditioning throughout, personal safe and complimentary local phone calls. Your ensuite bathroom features a rain shower head, hairdryer, cosmetic mirror and Urban Skincare co bathroom amenities. For your entertainment, HDTV, cable television and in-room i-pads and for the workaholics, a desk area with FREE WiFi access available and mini bar available on request. 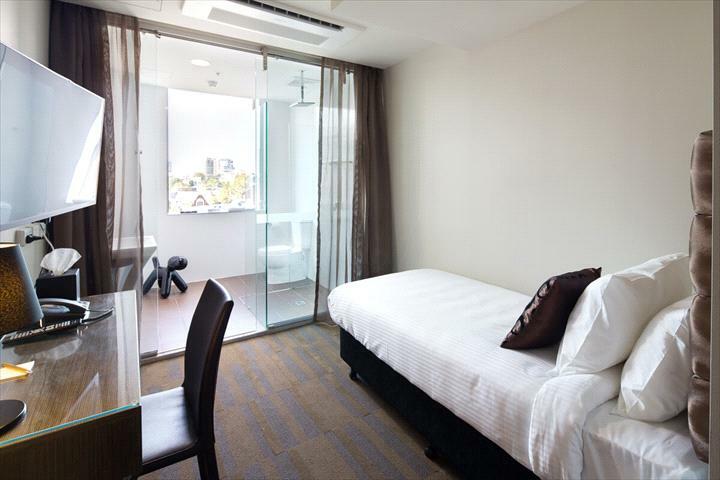 The King Plus One, are King rooms with a Single Bed. Ideal for families, with the comfort of a single bed than a rollaway. Some rooms have magnificent views of the city skyline and designer occasional chairs. 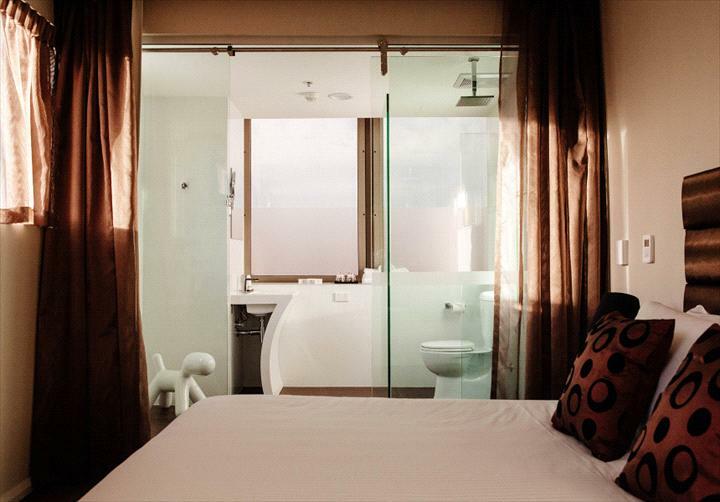 Your comfort will be assured with ensuite bathroom featuring rain shower head, hairdryer, cosmetic mirror and eco-friendly bathroom amenities. For your entertainment, HDTV, cable television and in-room i-pads and for the workaholics, a desk area with FREE WiFi access available and mini bar available on request.